DURIAN (Durio zibethinus ) a native to Borneo, produce fruits with a unique appearance, taste, flavour and aroma. This fruit tree grows tall and straight to a height of 30 m in the forests. However, grafted orchard trees seldom grow over 12 m.
The durian fruits are ovoid to ellipsoid, large, weighing up to 5 kg with thorny surface like jack and normally olive green in color. People have strong like or dislike for this fruit. Many like it, because of its sweet, delicious and filling taste, while others dislike it for its highly objectionable odour. The penetrating odour is comparable to that of rotten onion ad is unacceptable to many. However, once the odour barrier is overcome by a strong determination, the experience of eating a good durian is never forgotten. 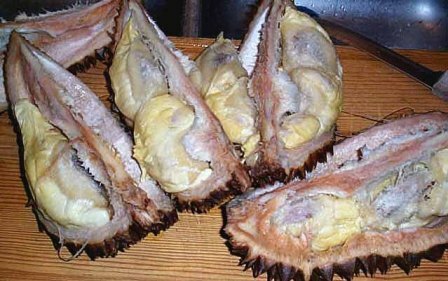 The durian is grown intensively and commercially for its fruit only in Indonesia, Malaysia and Thailand. In India, there are no large orchards or commercial plantings of durian, but for some trees in and around Nilgiris (Tamil Nadu) and West Coast. The 5 loculed fruit has 2-3 seeds in each locule, surrounded by light color, mealy, sweet aril, and the edible pulp. The seed is readily separable from the pulp, and are edible when fried, roasted or boiled. The pulp is rich in sugars (12%), protein (2.8%) and carbohydrates (34%) in addition to iron, B vitamins especially the uncommon but valuable vitamin E. When durian fruit is consumed, it gives a feeling of internal warmth, followed by a glowing sensation, and this has led to a strong belief that the fruit has aphrodisiacal qualities. The fruits are highly prized both as fresh fruit and in processed form. Durian also has some pharmacological properties, e.g. decoction of roots is used to treat fever and that of leaves and roots is used to check inflammation, infections and to treat jaundice. Durian thrives in humid, equatorial climate with short or no dry season. An annual rainfall of 200 cm is a minimum requirement, but heavy rains prior to flower initiation affect normal flowering, and the production decreases. If minimum temperature falls below 8`C, the tree suffers from cold injury. Trees of durian grow on different types of soils with 5-6.5 p H, provided they are moist, well aerated and rich in organic matter. Deep silt or loams with good drainage and high level of fertility are ideal foe its cultivation. However, the trees are susceptible to strong winds, which cause breaking of limbs or even trunk. There are more than 27 species of Durio, the genus to which durian belongs. Apart from D.zibethinus, at least 6 of them have some edible value: D. testudinarum, D. graveolens, D.grandiflorus, D. dulcis, D. oxleyanus and D.kutejensis. Of these, D. testudinarum is almost as important as D. zibethinus. Each of these species has many variants for fruit size, fruit color and leaf area. 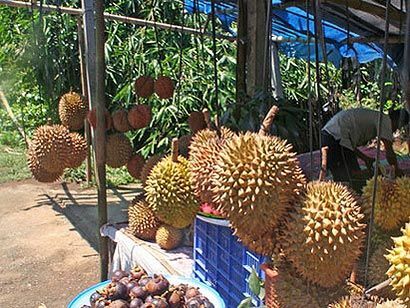 As many as 300 strains/ varieties of durian are reported, but only a few of these are propagated by commercial nurseries in countries where these are popularly grown. There are distinct variations in flavour, aroma and other fruit characteristics among the cultivars, which are readily distinguishable even on cursory examination. Those with better market demand have less of the objectionable flavour and small seeds. Chanee, Kanyao, Frog, Bojol, Ketan, Gombat, Mong Thong, Golden Pillow, Kob Champa, Lalong, Otang and Hepe are prominent cultivars. Planting of more than one variety/ clone should be done in an orchard to facilitate cross pollination and better fruit set. Usually the growers propagate durian by seeds and their off springs vary from generation to generation due to genetic heterozygosity. However, the recommendation would be to go for vegetative propagation of proven elite trees. Although no standard rootstocks are known, better results are obtained if rootstock of the same species is employed. The seeds of durian are variable in size and are notoriously short lived; the viability is affected by exposure of seeds to sunlight or high temperature for long period of time. Seeds do not store well even at low temperature. Large, healthy, fresh seeds are sown in well drained soil, preferably in polybags or earthen pots. Seeds germinate in 3-4 days and subsequent growth of the seedlings is fairly rapid, producing a good sized seedling suitable for grafting in about 2 months. The modified forkert method (modification of patch budding), inarching and approach grafting are common methods of propagation. However, air layering and propagation by cuttings are impractical. Planting can be taken up at 10-12 m spacing on the square system. Other principles of planting are same as in avocado. As durian is a native of rain forest, its young plants are prone to desiccation needing regular watering till they establish. Other aftercare practices as explained for avocado cultivation may be followed. Good soil moisture is essential for satisfactory growth and production. Irrigation is necessary if there is a long dry spell. Good mulch helps conserve moisture, reducing the need for irrigation. 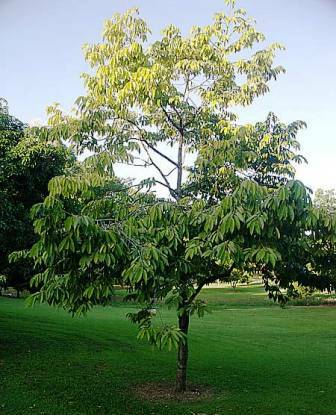 Grafted durian trees are precocious and produce crop in 4-5 years, while seedlings require as long as 10 years. The fruiting is clearly seasonal, available 2 times in a year. Immature fruits are picked only for use as ‘vegetables’. Fruits take about three and a half months to reach maturity. When mature, the fruits drop but it should be harvested since the fallen fruits do not keep long. Harvesting is done manually or with the help of bamboo poles when the fruits are smooth, flat with far apart spines. The yield varies with the age, variety, and agroclimate of the region. However, 100-120 fruits/tree are considered as good. The rich aroma of develops as fruits ripen and reach their peak in 3-4 days after harvesting and becomes soft. The ripe fruits deteriorate rapidly and cannot be transported over long distances. The edible arils normally constitute 33% of the total fruit weight. The arils can also be processed into durian cake (lempok) and durian jelly (tempoyak). The jelly is prepared from over ripe fruits and is sour. Dehydrated durian powder prepared either by spray or drum drying could be used as a flavouring ingredient for beverages, pastry, ice-cream etc. Ripe fruits can last for 4 days under refrigeration, while the mature ones can be stored up to 14 days at 10`-15`C or may be frozen for 2-3 months. The arils can be kept for about 3 months at -24`C.